You are here: Home / Search for "Louise Boyd Dale"
The Philatelic Foundation has various educational resources that can assist collectors in the study and understanding of their hobby. Over the years a number of research articles covering a wide range of topics have been written for the PF and by our staff. Click on the appropriate link below to take you to these articles. If you have a research article that you would like posted on our web site please contact llyons@philatelicfoundation.org. The PF has in its possession a number of fakes and forgeries properties. Over the summer we will begin to place these properties on our web site. An announcement will be forthcoming when the first property is posted. At that time you may click on the appropriate link below to take you to these pages. Using the PF’s new search program, PFSearch, you can research our certificate archive and find information about the stamps and covers we have examined. A link to that site is provided at top left. A list of all those have been involved with founding and sustaining The Philatelic Foundation since 1945 read like a “Who’s Who” of Philately. Many of the most distinguished provenances of United States and World philately have their associations with our organization: Lichtenstein, Dale, Steinway, Boker, Hubbard, Grunin… the list is endless. World-class experts have been an integral part as well: Ashbrook, Neinken, Boggs, Bloch, Green… to name just a few. But how did this all come to be? At that point you wouldn’t know what to do, and were left flying by the seat of your own pants. You weren’t educated enough to know the Grills by yourself, and you hated to pay the big price they commanded as the price of your education. This, of course, set you out on the track of which dealers you could trust and which dealers you couldn’t trust. In other words, you were out there on your own. 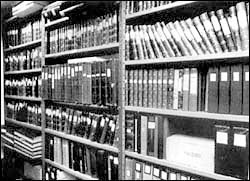 It’s as if you were trying to get a college degree by going to the library and talking to people, without having anybody around to explain some of the fine points of what you were reading, or clearing up the information in the books that was hard to understand. certificates for stamps printed after 1948 for many years, not then having suitable reference material). The PF also acquired the research notes and correspondence of Stanley Ashbrook, collections of Sperati and Fournier forgeries, a complete photographic record of the famous Caspary collection on its original pages, and continues to receive photographic records of major specialized collections. These holdings, together with thousands of years of collective experience on the part of the staff and the volunteer consultants (collectors, dealers and auctioneers alike), have made the PF’s certificates the standard of excellence, accuracy and confidence in the philatelic world. 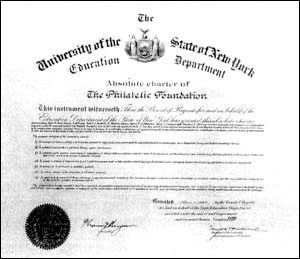 Having issued just a thousand certificates in 1945 to over a half million certificates now, an opinion of authenticity issued by the PF is the most authoritative and respected in the hobby. And the opinions and digital images of the stamps and covers on those certificates are available on-line and have been used for serious research, everything from pin-pointing new classic plate varieties that have been included in the standard catalogs, to uncovering and helping stop fakers and forgers and manipulators of stamps and covers. The Philatelic Foundation today truly fulfills the vision of its founders. It deserves the support of every serious philatelist. Become a contributor, send us copies of your latest philatelic handbook or monograph, offer to come in and discuss areas in which you are the recognized authority… There’s a lot of ways you can be part of The Philatelic Foundation family! We have posted a few articles on people who were crucially involved in the early years of our organization, as listed below. The Steinway name is well known to most Americans. This distinguished American family is famed for their manufacture of quality pianos, and in the musical world, the name “Steinway” is synonymous with excellence. The Steinway pianos were crafted by hand; quality was always the primary concern. Few American manufacturers any longer place such an emphasis on quality as the Steinways did with their pianos. Theodore E. Steinway was born in 1883. He joined the Collectors Club of New York in 1912. 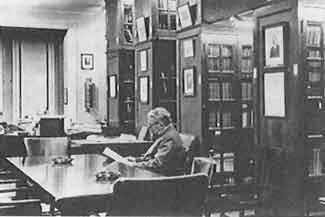 In 1922, he provided the funds for the Collectors Club to purchase the extensive philatelic library assembled by Chief Justice Suppantschitsch This was a momentous step for the Collectors Club, and from that time their philatelic library became and has remained one of the most extensive in the world. Fittingly, after his death, the Theodore E. Steinway Memorial Publications Fund was established by the Collectors Club in his memory. Theodore E. Steinway saw the importance of careful scholarship and philatelic literature for the future of the hobby. He also saw the importance of establishing and maintaining standards of integrity. In 1945, he joined with the other prominent American philatelists and became an original incorporator of The Philatelic Foundation. PF co-founder Alfred F. Lichtenstein, who was the first Chairman of the Foundation’s Expert Committee, was a close personal friend. 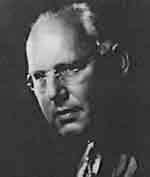 From 1950-52, succeeding Admiral Frederick R Harris, Steinway became the third Chairman of the PF’s Expert Committee. During his tenure, the PF’s headquarters was located on the fourth floor of the Collectors Club, one of the places nearest and dearest to his heart. Some older philatelists might still remember the “Theodore E. Steinway Nights” there, an annual event that insured a “standing room only” crowd. Steinway had a flair for theatrics and was an accomplished amateur actor. These skills were put to good use when he spoke on any topic relating to philately. As Chairman of the Expert Committee, Mr. Steinway demanded attention to detail and perfection. Just as his family’s pianos had become the most respected in the world, he insisted on the highest level of professionalism and quality for The Philatelic Foundation. He was a “take charge” Chairman, and inspired others to work with the same dedication that he exemplified in his own life. He continued to bolster the standards of excellence that have remained the cornerstone of the PF, was a genuine ambassador of goodwill for the PF and for philately. No matter how busy he was, he was always willing to give of his time to help others. He participated as a judge and an executive in numerous international philatelic exhibitions. 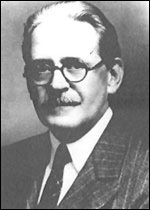 He and Alfred F. Lichtenstein were the galvanizing forces behind the 1947 Centenary International Philatelic Exhibition (CIPEX). Following Mr. Lichtenstein’s untimely death in 1947, Theodore E. Steinway served as Chairman of the jury at CIPEX. As for his collecting habits, Linn’s World Stamp Almanac describes him as the “Renaissance Man” of American philately because of the scope of his collecting interests. Henry M. Goodkind called him “the true old-time collector, always enjoying to assemble as many stamps as possible.” His most famous collection was his specialized study of the “Sydney Views” of New South Wales. Of German descent, he also prided himself on his major collections of Hamburg and old German States. Mr. Steinway also built a significant collection of stamps with “socked-on-the-nose” cancellations. He did not seek to follow the herd, but sought his own directions in his philatelic pursuits. Interestingly, some of his collections became harbingers of future developments in the hobby. Mr. Steinway was perhaps the first prominent philatelist to embrace topical or “thematic” collecting. Perhaps his most favorite collection was the one that merged his vocation with his avocation, a large and important collection of stamps and covers relating to his family business — music on stamps. In all reports and reminiscences of Mr. Steinway, several things stand out. He reached a level of competence, if not excellence, in all traditional and scholarly aspects of philately. He blazed paths that future generations of philatelists would follow. But, Mr. Steinway’s most unique and extraordinary qualities were those of his personality. Theodore E. Steinway was a kind, caring and generous human being. He did not enter and rise in the world of philately in order to gratify personal ambition or to show off his own superiority or to seek financial gain. He exemplified the spirit that has made philately the greatest hobby in history. He saw philately as a means of sharing experiences with his fellow man and enriching the quality of life. For all his tireless devotion to the hobby and its betterment, he never lost perspective. He was a devoted family man, and took great joy in his familial roles as husband, father and later grandfather. The well-being of his family and the education of his six children took priority over new acquisitions for his stamp collections. Also, in a hobby too often dominated by elitism and cliques, Steinway went out of his way to embrace the newcomer. He always found time to be helpful and encouraging to younger philatelists. He saw that the great philatelists of tomorrow are the beginning collectors of today. On April 8, 1957, philately mourned the passing of Theodore E. Steinway at the age of 73. After his death, most people learned of the true level of his self-sacrifice and generosity for the first time. On numerous occasions he had helped collectors who were having financial difficulties; he had quietly made the financial arrangements for promising philatelists to attend important international exhibitions and gain international judging experience when they were not otherwise financially able. His son, John H. Steinway, carried on the Steinway philatelic tradition, and he too served on the Board of Trustees of The Philatelic Foundation. John H. Steinway passed away on August 29, 1989 at the age of 72. Long before women were fully accepted in American society (e.g., at the time of her death in 1967, women were still barred from attending Yale, Harvard or Princeton Universities), Louise Boyd Dale rose to the top of American philately. In 1952 she was named Chairman of The Philatelic Foundation’s Expert Committee. Working with Executive Secretary Ethel Harper, Dale oversaw the first move of the PF to its own facilities. 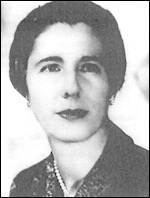 In 1953, she persuaded Alfred H. Caspary to serve as Honorary Chairman of the Expert Committee. She continued to build up the Foundation’s Reference Library and Reference Collection, oversaw the establishment of the PF’s weekly “Philately on the Air” syndicated radio broadcasts, instituted the first PF Seminars, inaugurated the PF’s series of publications and entered into an arrangement with Columbia University to grant college degree credits for Winthrop Boggs’ “Foundations of Philately” Course. These were years of tremendous growth and expansion, and under the tenure of Louise Boyd Dale the PF entered the modern age. Dale was also an accredited philatelic judge, and in 1956 became the first woman to serve on the jury for an International Philatelic Exhibition (FIPEX, New York). The philatelic community mourned the passing of Louise Boyd Dale in 1967 at the age of 54. In October, 1968, the H. R. Harmer firm commenced a series of eleven sales of the first part of the famed Dale-Lichtenstein Collection. In 1989, Harmer’s of New York started bringing down the gavel on the second part of this legendary Collection. This series of auctions ranks with the greatest philatelic auctions of all time, and stands as a monument to both Alfred Lichtenstein and to Louise Boyd Dale. The Mortimer L. Neinken Medal for Meritorious Service is an award presented by the Philatelic Foundation on a yearly basis. It is a widely recognized, prestigious award and is the highest honor awarded by the Philatelic Foundation. The winner’s include a “who’s-who” of philately and is presented to those who have shown absolute selfless service to philately. The award, first presented in 1981, was renamed in 1984 in honor of Mortimer L. Neinken (1896-1984) after his passing. Neinken was a well-known student of classic 19th century United States stamps. He supplemented much of Stanley Ashbrook’s publications and published numerous articles and books on 19th century U.S. stamps – much of which is still relevant and widely used today. He was an expert for the Philatelic Foundation and even served as the Chairman. Some of his best known publications include “The United States Ten Cent Stamps of 1855-1859” and “The United States One Cent Stamp of 1851-1861”. Neinken also wrote “United States: The 1851-57 Twelve Cent Stamp (1964)”. His distinguished awards include the Luff Award (1962) for Distinguished Philatelic Research, the Lichtenstein Award (1971) and was entered into the American Philatelic Society’s Hall of Fame (1985). 1985 William H. Miller, Jr.
1983 John R. Boker, Jr.